The old Blizzard platformer Blackthorne is now a freebie on Battle.net. Psst! Hey, kid. Ya like free games? Here's one for you: Blackthorne, an action-platformer released by Blizzard in 1994, virtually side-by-side with Warcraft: Orcs & Humans, the game that would eventually propel the studio into the big-time and probably the reason why most people have never heard of Blackthorne. It was actually a pretty decent game for its time, with powerful echoes of Prince of Persia but set on an alien world and featuring a muscular, Fabio-like hero armed with a shotgun; in fact, PC Gamer described it as "Prince of Persia with a shotgun and a bad attitude." And while it's pretty seriously dated at this point, it's also pretty seriously free, which makes up for an awful lot. If you want it (and hey, why wouldn't you?) just pop over to Battle.net and scroll down to the "Classic Games" section at the bottom. Click the Blackthorne link to download it, then run the installer when it's done. Ka-blammo! 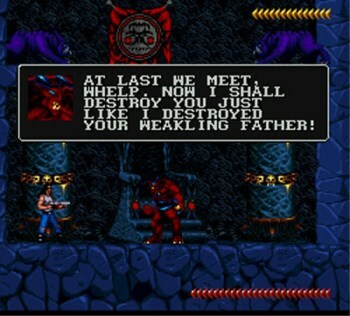 You're Blackthorne-ing! It seems that Blizzard has put some work into making it compatible with modern PCs, as the installer and the game both run flawlessly on Windows 7 and the launch screen is emblazoned with the phrase "Classic Arcade" in big, blocky white letters. It's a surprisingly painless process - you don't even have to be logged into your Battle.net account to download the game - and hey, free is free. Get it while it's hot at Battle.net.